WP Portfolio is a Simple, Clean and Beautiful Responsive Free Portfolio WordPress Theme. Specially designed for designers, photographers, artists and creatives. It is designed with perfect Grid Layout and List Layout where you can choose Grid as well as List Layout for your posts. It is easily customizable with customize. There are two site layout (Narrow and Wide), Social Profile Navigation and many more. Also has custom background, header, menu, favicon, CSS, webclip icon, and logo. Supports popular plugins like WooCommerce, Breadcrumb NavXT, WP-PageNavi and Contact Form 7. It is also translation ready. Need more features? Upgrade to WP Portfolio Pro! Here comes the Premium version of our theme WP Portfolio with lots of amazing feature as per our user’s suggestions and request. 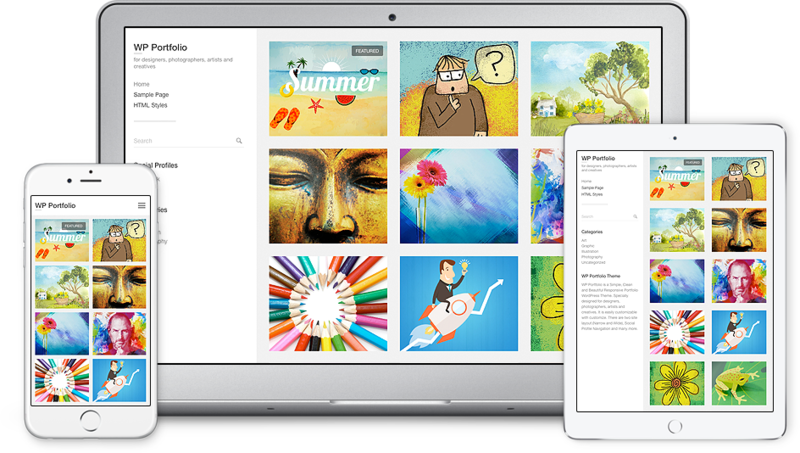 Have a look, what’s new on WP Portfolio Pro.